This poster discusses the possibility to epitaxially grow high-quality single-layer (SL) MoS2 on the Au(111) surface in ultra-high vacuum. Using scanning tunneling microscopy and low energy electron diffraction, the evolution of the growth can be followed from nanoscale SL MoS2 islands to a continuous MoS2 layer. An exceptionally good control over the MoS2 coverage is maintained using an approach based on cycles of Mo evaporation and sulfidation to first nucleate the MoS2 nano-islands and then gradually increase their size. Brief exposure to air is not found to affect the quality of the SL MoS2. 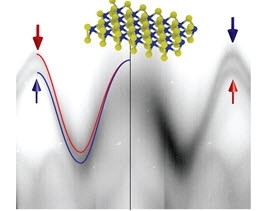 The electronic structure, band gap renormalization and electron dynamics of such layers are investigated by time- and angle-resolved photoemission spectroscopy(ARPES)[1-2]. “Static" ARPES permits the observation of the occupied states, permitting a detailed extraction of the valence band dispersion and the spin-orbit splitting texture in the MoS2 SL. In the time-dependent experiments, electrons are first excited into the conduction band by a low energy photon and then photoemitted by a high energy photon. This allows us to ascertain a direct quasiparticle band gap of 1.95 eV and determine an ultrafast (50 fs) extraction of excited free carriers via the metal in contact with the SL MoS2. Antonija Grubisic Cabo is a PhD student in Nanoscience at the Interdisciplinary Nanoscience Center at Aarhus University. She is primarily interested in electronic properties and electron dynamics of two dimensional materials, such as graphene and two dimensional metal dichalcogenides. She received M.S. degree in Physics from University of Zagreb, Croatia (2014) where she was studying complex magnetic systems.